Like no other subject, “Energy", offers itself in its complete value chain as a comprehensive “Network" topic. Energy supply is already a transnational task - one that does not stop at international borders. Energy in the form of electricity, which is produced by e. g. offshore wind in the north or photovoltaics in the south, by hydro or geothermal power, will be transported to the location where energy demand exceeds the amount of production. all of these are technical challenges that can be managed fast and most effectively by collaboration of companies and industry experts, technology leaders from across Europe. EUROPE - a sustainable, resource-saving energy supply with renewable energies is the basis for a healthy life, it creates jobs and prosperity, strengthens the economic power of Europe, promotes the cohesion of European countries, and maintains peace within Europe. It also leaves future generations a worth living environment. EurA provides its scientific, technical, financial and promotional competences to enable researchers in companies and research facilities to create a common Europe - and thus to develop and establish a sustainable, resource-saving energy supply. 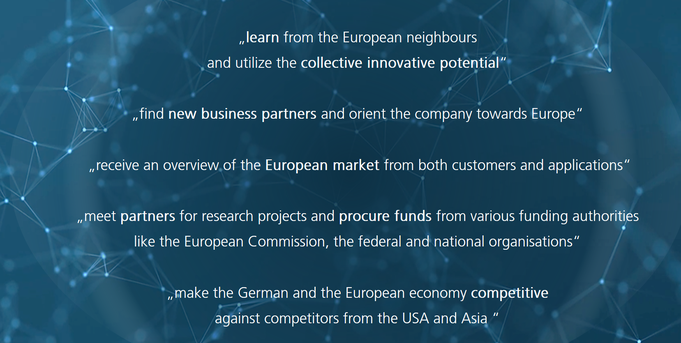 With Energy Innovation Europe, EurA provides a viable management structure and reliable international contacts; the success of EurA is based on the collaboration of experienced project management specialists who recognize innovation nuclei, develop innovation strategies, and utilize products and services.